Lindsay's work is all hand built and the majority of her work is made using rolled out slabs of clay, which are cut to shape and joined together in various ways. The softness of the slab dictates how rigid the shape can be; she finds that using really soft slabs, forms evolve much easier and are more pleasing in a tactile way. Once the work is dry it is bisque fired to 900ºC. 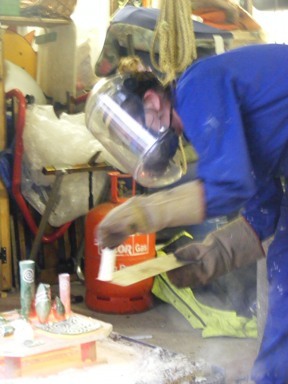 Lindsay applies wax resist to form the pattern and then glazes. 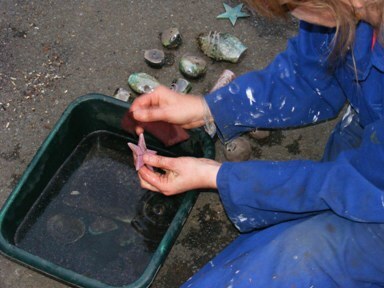 The pieces are then Raku fired to 960 ºC. Lindsay uses two different clays and at present an Icon Handbuild from Potclays and a finely grogged earthstone from Valentine Clays. The grogg ensures the clay will withstand the Raku process and the whiteness ensures the coloured glazes give their best colour. 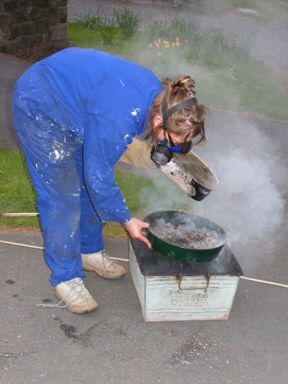 Scroll down for pictures of the Raku firing. 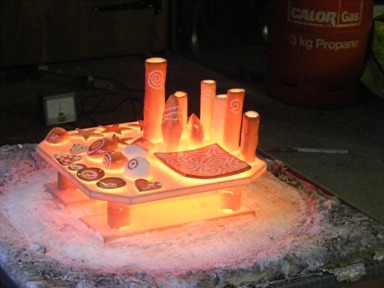 The kiln has reached 960ºC, and the lid has been taken off, exposing the red-hot glowing pots. Lindsay is taking out the pots to put in sawdust; it's a balancing act. Here Lindsay is sieving the sawdust to find the pots, especially the small ones.